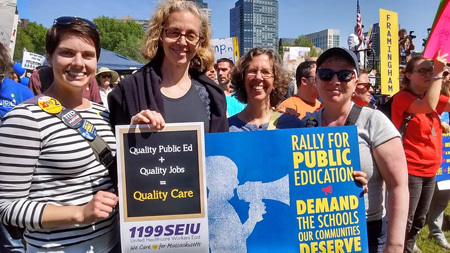 QUEST chose our name carefully to reflect our vision for public education: Quality Education for Every Student. First and foremost, fulfilling that vision requires human resources: the many different people whose skills and commitment create the teams that make great education possible. To effectively educate our children, those people need access to ongoing training and all sorts of educational materials. 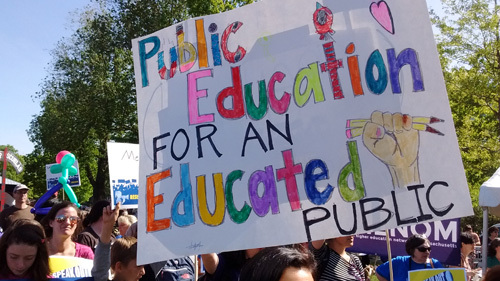 Teachers’ compensation should recognize their contribution to the community, and they should never have to reach into their own pockets to buy basic materials for their students. Education takes place in educational facilities: school buildings that must be adequate to the task of educating the whole child. Our schools must also provide a safe and healthy environment for our children. Once in place, school buildings must be maintained and regularly updated to accommodate new educational technologies and new approaches to creating a safe and healthy environment. Again, equity does not mean equal. Investments in school buildings must reflect the diverse needs of the city’s population and, especially, the historic disinvestment in the education of children of color. 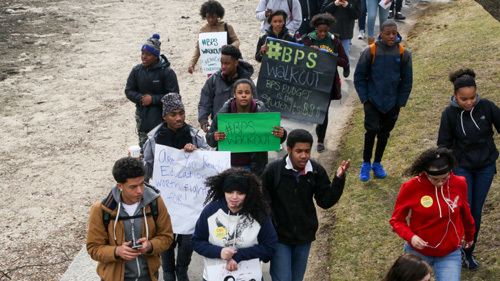 In Boston, powerful structural pressures work against adequate public school budgets. 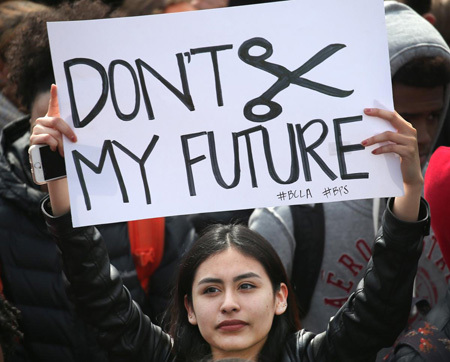 Federal funds for public education are in decline and the current national educational leadership favors school vouchers, public support for charter schools,and other solutions that undermine public school financing. The courts have forced the Commonwealth of Massachusetts to recognize inequality among communities by subsidizing education investments in disadvantaged communities. However, the system through which these investments are made has not been updated in decades to reflect new and worsening inequalities. Furthermore, an increasing percentage of state funds for education is going directly to the growing charter school sector, to the detriment of district budgets. Foundations, corporations and individual donors have invested impressive amounts in Boston’s schools, but these private investments can never compensate for the lack of a strong public commitment, and private funds often worsen inequities among our schools. In this difficult environment, the City of Boston has had to shoulder much of the burden of the increasing cost of educating Boston students. The city has increased the absolute dollar amount it invests in public school, but educational spending as a percentage of the total budget has remained stagnant, and budgets are not keeping up with cost inflation. The result is an annual struggle over budget dollars in which schools and students inevitably lose. QUEST believes that a city with Boston’s wealth can and must invest more in its schools. We also question whether or not equity is always at the forefront of the minds of those making the decisions about how Boston’s education resources are allocated. The financial challenges of the Boston Public Schools are perhaps best reflected in the condition of the district’s school buildings. While some modern facilities have been constructed and others rehabilitated, the overall state of our school buildings is a disgrace. Every day, parents and guardians send thousands of children into buildings with contaminated water, unsafe air quality and a variety of other physical problems that increase the challenges of providing quality education in those buildings. For example, many schools lack libraries, other lack gymnasiums or outside recreation spaces and some do not even contain a proper cafeteria space where children may comfortably eat in-school meals. To its credit, the BPS has launched “Build BPS,” a comprehensive facilities planning process that loudly promises to invest $1 billion in the City’s school facilities. We ask that you keep an eye on this billion-dollar promise. While QUEST applauds this long overdue district-wide look at the state of our school buildings and how they are being used, we question whether or not Build BPS incorporates our concerns about equity, transparency and accountability in education. We remember too well that the precursor to Build BPS was a report by the Boston office of McKinsey & Co. (commissioned by City Hall) that used very questionable data about school capacity to recommend another round of mass school closings in Boston. 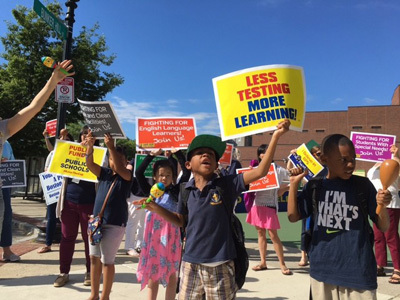 QUEST will continue to be among those groups in Boston demanding that any plan for school investments in Boston comes out of an open process that recognizes the importance of always using the equity lens and understands how previous school closings have devastated certain communities in the City.